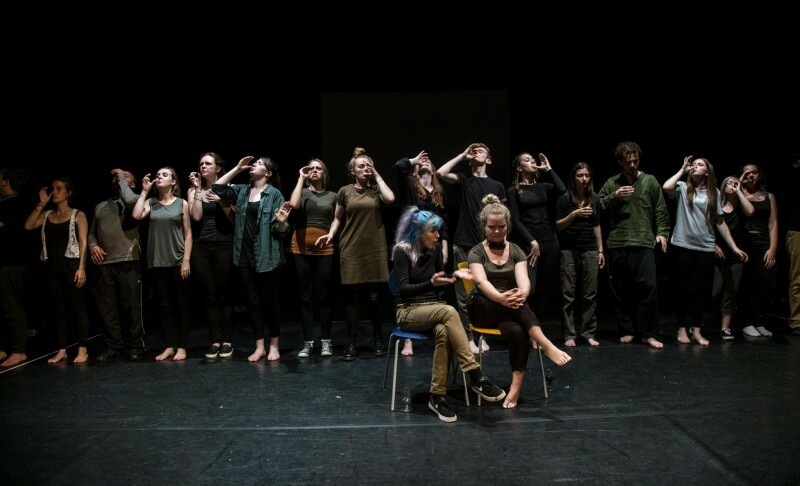 Barbican Theatre invites dancers and actors aged 14 – 25 to audition for their two cutting edge performance companies, COMPANY b Dance & COMPANY b Theatre. These two companies are integral in creating exciting new work in Plymouth and are part of Barbican Theatre’s Performance Training programme for 18 months – 25 year olds. In the last year, COMPANY b Dance had an action-packed calendar, which included training alongside renowned choreographers Richard Chappell and opening his Burnt Norton, Iris and The Vast Rocks triple bill. They also performed in events such as All Boys Dance Platform and Spindrift’s ‘Mergecology’. Their final summer platform ‘For The Love Of Earth’ featured two evenings of thought-provoking dance theatre researched and choreographed by COMPANY b Dance on a topic they all felt strongly about. They incorporated a number of elements into their piece including global warming, fracking and emissions. The performance received rave reviews. COMPANY b Theatre had an equally incredible opportunity-crammed year, including residencies and workshops with visiting companies including Mars.tarrab and Theatre By The Lake. Their end of year performance was of Martin Crimp’s Attempts On Her Life, possibly his most highly-regarded and most innovative play. A fragmented work, it challenged the audience to question what makes a play and whether society can ever really know and understand another person or what happens in the world and was split into 17 scenes. The two date show received some incredible reviews. Young people who join COMPANY b enjoy tremendous opportunities to take part in high quality training and performance. As well as developing skills in technique, choreography, devising and performance, they gain invaluable life skills and leadership training. This training is ideal for young people studying GSCE, A Level or Higher Education courses in Dance/Theatre, as well as for those with limited or no previous experience, but with a burning desire to develop and progress. Regular performances in the theatre and in more challenging and unusual environments, give company members the chance to develop their performance skills and create opportunities for development. Barbican Theatre are specialists in helping young people to hone their talent and reach their potential. Thanks to their way of working, many of the young people who have trained with Barbican Theatre have gone on to study at the best Drama and Dance Schools and Universities in the country. If you want to develop your theatre or dance skills, boost your confidence, learn skills for life, make stunning performances, work with experienced practitioners and be a vibrant part of the city’s culture, come along to the COMPANY b auditions. People with all styles and all levels of experience are welcome. COMPANY b auditions are informal and held as workshops to give attendees a taster of what to expect from the classes and to mix with the current members. COMPANY b Dance auditions take place on Tuesday 20 and 27 September from 6-9pm, whilst COMPANY b Theatre auditions are on Wednesday 21 and 28 September from 6-9pm. The auditions will be held in Barbican Theatre’s auditorium at Castle Street, Plymouth, PL1 2NJ. To register for an audition, email btpt@barbicantheatre.co.uk or call 01752 267131. Visit www.barbicantheatre.co.uk to find out more about Barbican Theatre and their Performance Training programme.